The last turkey I smoked was during one of our Weber product photo shoots earlier this year. It was a huge bird, and if it turned out anything like the turkey we had smoked a few days prior, it was destined to be the star of the holiday dinner scene. Sadly, I never got a bite, and worse, the turkey never even made it to the set. It was the last shot of the day, and bad weather was moving in. We were scrambling. The real family, who was the talent of the scene, had just sat down when bam - the storm hit. In fact, it was not just a storm, it was a microburst, or rather a non-rotating tornado. As the crew raced for cover in the backyard, our grill camp in the front drive turned to wet chaos. We dropped our pop-up tents, stashed our supplies into trucks, and got wet, real wet. Branches fell down around us, and the power went out in the neighborhood we were shooting in. To put it professionally, it was nuts. As we waited for the weather to pass, which it finally did, the decision was made to wrap for the day. Thankfully it was not only the last shot of the day, it was the last shot of a super successful week. As I walked back around front to survey the remains of our grill station, I found our Weber Smokey Mountain Cooker still vertical and more importantly, still smoking away. Under the lid, the turkey was to temperature. It looked beautiful, and the owners of the home we were using suddenly had dinner. I would have taken a photo with my phone to savor the moment, but I was not the only thing drenched in water. So here it is a few months later and what I am craving? Yeah, smoked turkey. Here’s the process, this time with great weather. 1. Bring the butter to room temperature and mix with the rosemary and thyme. 2. With a pair of poultry shears, remove the wing tips. Starting at the bottom cavity, use your fingers to separate the turkey’s skin from the breast meat. Work slowly up towards the neck being careful not to split or tear the skin. 3. Once separated, work equal amounts of butter on to both breasts and down towards the thighs. Season the inside of the turkey cavity with salt and pepper. Place the orange quarters inside the cavity and truss the turkey with the butcher twine. Note: Trussing promotes even cooking by keeping the turkey compact and as an added benefit, makes for a more attractive bird when cooked. 4. Pat the turkey dry with paper towels. Tip: For crispy skin, leave the turkey uncovered in the refrigerator overnight. 5. Season the outside of the turkey with salt, pepper, and the orange zest. Rub all over with olive oil. 6. isassemble the WSM and fill the fire ring halfway up with charcoal. You will roughly cover up the first layer of circles. 7. Fill a charcoal chimney half full with charcoal briquettes and light. 8. Since this is a hot cook, there is no need for water in the water pan. To make cleanup easier, think about lining the pan with aluminum foil. 9. Once the coals in the chimney have turned grey and ashed over. 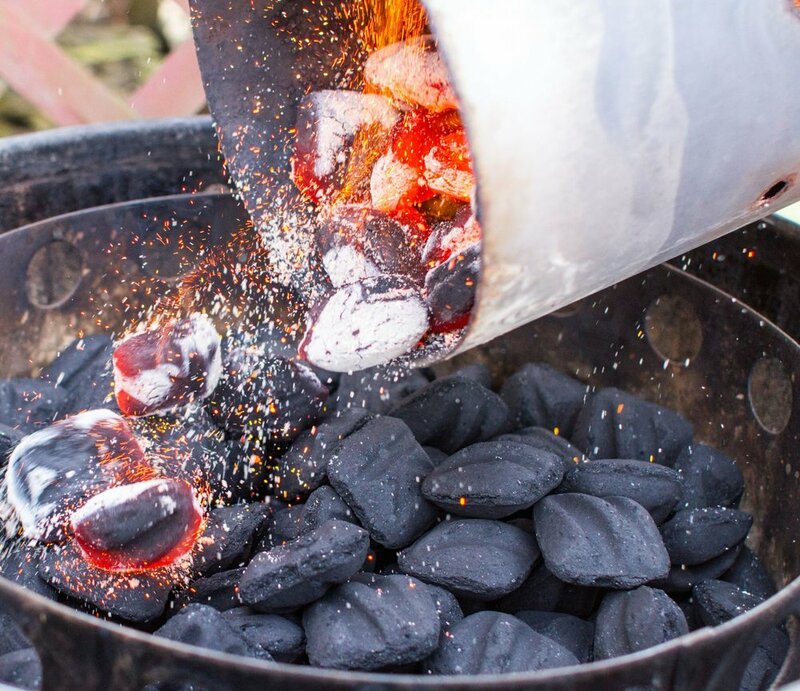 Dump them over the unlit coals in the base of the smoker and let sit for about 10-15 minutes. 10. Re-assemble the smoker. If you plan on making a pan gravy, be sure to place a disposable foil tray on the lower grate. 11. Grill the turkey over medium low heat, 300-350 F. As the smoker climbs towards 300 F, place the turkey on the top grate. 13. Open the front door panel and place no more than 2 or 3 medium chunks of wood on the hot coals. I always opt for something sweet, like apple or cherry. An aggressive species of wood can be too harsh. In this case, a little goes a long way. 14. If the fire burns too hot, close the bottom vents halfway. If you are battling cold weather, and need to keep the temperature up, add 8-10 unlit briquettes every hour. Figure 15-18 minutes of cook time per pound. Cook until the deepest part of the thigh reads 165 F with an instant read thermometer. 15. Before you carve into that beautiful bird, share your pictures with us!